For this particular recipe I used 1 package Pillsbury Ready To Bake!® Big Deluxe Cookies N Creme cookie dough. I have also used the ready made Oreo crust available in the baking aisle at your grocery story. If you would like to make your own crust, crush about 25 cookies. Mix crushed cookies with butter; press onto bottom and 2 inches up side of 9-inch spring form pan. If using the cookie dough crust: In ungreased, 9- or 8-inch square pan, break up cookie dough. With floured fingers, press dough evenly in bottom of pan to form crust. Place in refrigerator until cheesecake mixture is done. In small bowl, beat cream cheese, sugar, vanilla and eggs until smooth. 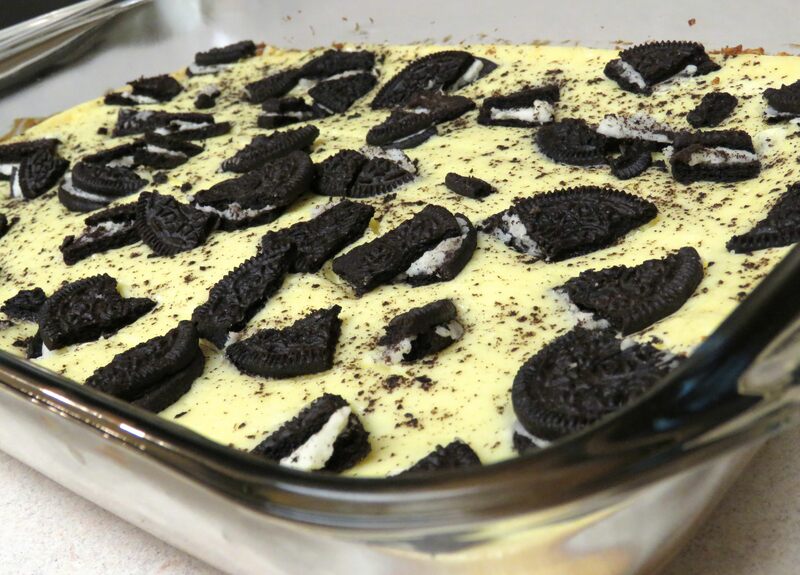 If you would like Oreos throughout the cheesecake, feel free to crumble up 10-12 cookies and mix in cheesecake mixture. Spread cheesecake mixture over dough, or in ready made crust. Crumble remaining cookies and sprinkle on top of cheesecake mixture. Bake 45-60 minutes or until golden brown and firm to the touch. Cool at least 30 minutes in refrigerator. Store in remaining cake in refrigerator.